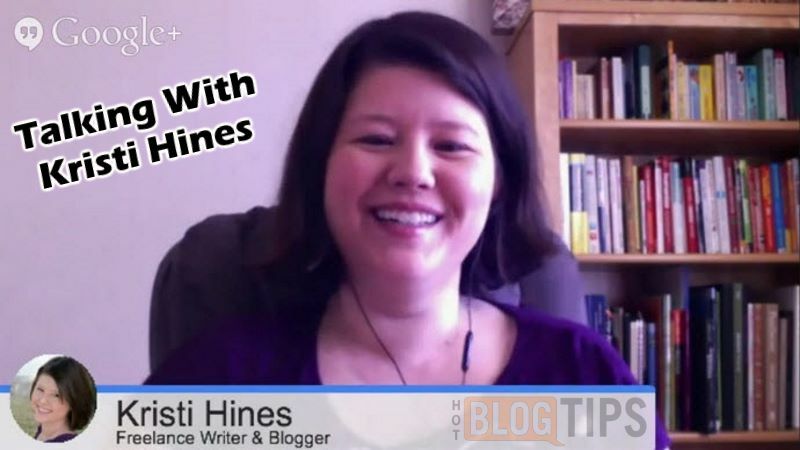 I’d like to thank Kristi Hines for hanging out with the Hot Blog Tips Hangout Crew last Sunday. I’d also like to thank Mitch Mitchell for putting the interview together for use. Kristi talked blogging, social media, promotion and much more with Sheryl Loch, Mitch and myself in an informal chat. Kristi Hines is a wife, mother, freelance writer, ghostwriter, professional blogger and a true inspiration to thousands of bloggers everywhere.Visit Kristi Hines’ blog at Kikolani.com. 16 Modules with everything from free traffic and influence marketing to paid syndication. Note: I don’t normally include transcripts in these types of posts but I did for this video. It’s pretty lengthy for a 26 minute video so feel free to skip past it and don’t let it stop you from commenting. Mitch Mitchell – Hi, this is Mitch Mitchell from I’m Just Sharing. Welcome today to our Google Hangouts, our weekly online series. I’m here with Brian D Hawkins of Hot Blog Tips and Sheryl Loch of Fuzzy Wuzzy Anipals and today we have a special treat for you, we have Kristi Hines, one of the best smiles on the internet, from Kikolani.com and pretty much anything you can think of. Kristi, we see you everywhere, it’s just amazing and we thank you for joining us today. Kristi Hines – Well, thank you for inviting me. Mitch Mitchell – No problem. So my very first question to put you on the spot right off the bat is what made you decide on writing, blogging, and social media as a career? Kristi Hines – I really didn’t think about it as a career, it actually started out as a personal site where I did poetry and things like that. I wanted more people to look at it, so I got into more of the marketing side, and as I got into it, I was like, oh I like writing about this, so I started writing about that and one thing kind of lead to another and then here I am. Mitch Mitchell – You’re tireless; I mean we see you everywhere. Your website is ranked really high, I see your posts on other sites and they get tons of readers and visits and whatever, and it’s just amazing. You even have a baby on top of it all. Kristi Hines – It takes a lot of time management. A lot of time management, organization, working strange hours, and just being okay with it. Mitch Mitchell – I don’t want to hog the whole thing up, I want to see if Brian and Sheryl have anything before I go to my next one. Brian Hawkins – Kristi, my follow up question is really on the same thing and it’s with time management. I have no idea how you do it. I see you absolutely everywhere. I think you must be on hundreds of blogs, you’ve got your main blog, which by the way in early spring or something like that, you took over completely on your own. So you kind of got rid of the guest posts, which Kudos to you, I think that was a Smart Move, for your branding. Kristi Hines – Well thank you. Brain Hawkins – Of course you know, you’re way above me on that type of thing. I see you on Social Media Examiner and social media… every kind of website, and now you’ve got Lucy? How old is she now? Kristi Hines – She’s eleven months old now. Brian Hawkins – Eleven months old, and you’ve got to take care of Jason, and you like photography, and poetry, and ballroom dancing. I’ve seen some pretty cool videos with that. So, you’ve got all these interest, but somehow you still manage to stay up with all the major social media networks. What is your secret weapon? Do you have like fifteen VA’s or something? What are you doing? Kristi Hines – No I actually don’t, I just kind of work whenever I get a chance to. A lot of people have really set schedules and if I can’t work during these hours, then I can’t work at all. Me, I’ll be like standing in the grocery store line and there’s nothing else to do, so I’ll pull out my Twitter and see if there is someone I could chat with. So it’s kind of, I just make the best of whatever kind of time I have. Brian Hawkins – You must have some sort of….writing must be in your blood. You can just come up with these topics, I mean when you’re a guest blogger and I don’t think you’re a guest blogger on a lot of these blogs, I think you’re just a regular writer for the big branding blogs. They’re not just little bitty quick posts; I mean, I know these take research and you’re up on SEO like nobody’s business. So you put a lot into those. How long are you spending on a blog post? It takes me several hours just to do one for Hot Blog Tips. Kristi Hines – It kind of depends on the blog post and the topic. If it’s something I like, that I’m really into at the moment, I can usually do it in an hour or two. If it’s something that takes a lot of research, then maybe like five or six, it really just depends. Brian Hawkins – Wow, you must have more than 24 hours then. I’m just blown away, every time I see… I see your name everywhere. Like I said, it’s on some mega sites and then your own blog is a mega site in itself and you’ve grown that. I can remember when, I think it was like 2008 or 2009, you first featured me in Fetching Friday. You’ve kept that going that entire time. Most of us have started these little features on our blogs and can’t keep up. So we close them down and try something else later and you kept that going for years. Kristi Hines – Well, honestly, I haven’t done it in like the past two months. In October, I did like three different conferences, so I was like, traveling, barely at home for a little bit, then traveling again. So I kind of had to take a break on that side, but I’m planning on starting it up again. Pretty much like next week. Sheryl Loch – Okay Brian, so if she’s also traveling while doing all this and being a Mom to someone who is probably moving pretty fast, I’m just going to say, you’re really slacking now. She just really knocked you. Brian Hawkins – I don’t want to hog it up, so go ahead Sheryl. Take it away. Sheryl Loch – Okay Kristi, I saw that on September 5th, 2013, which hasn’t been that long ago, you announced that you were putting out your very first Premium Training Course and it’s Blog Post Promotion, The Ultimate Course and it contained 16 modules with things from free traffic, influence marketing, to paid syndication and you have a saying on your sales page that says, “You can’t just create great content, you have to promote it.” So my question is, when it comes to this course, how much time was spent in creating the course and designing the course, compared to how much time was dedicated and use for a promotional plan and putting that promotional plan in action? So that we can get an idea, that the creation is only a part of it, and how important is designing your promotion, and is that going to take the same amount of time as making the course? Kristi Hines – I would say that making the course was a little bit unique, because I actually had it as an ebook a couple of years ago, so basically, what I did for the course was, I rewrote everything, so that I could make sure that it was all updated and then I added a whole bunch of information on top of it all. Honestly, I did it off and on, because I was still doing my client work, and I was also tending to my baby, and everything else. So I don’t really have a set amount of hours that I was doing it, I was kind of doing it anytime that I had free time. I would say that the balance was probably like 50/50. Fifty percent of actually setting it up, going through all the technical issues, and getting the content all formatted, to actually sending out emails to people, and promoting it on social networks and creating ads, things like that. So I’d have to say that it’s really not about just creating the course. It’s the same with blog posts, you can’t just create the content, you’ve got to go out and do the promotion for it, otherwise no one’s ever going to know about it. Sheryl Loch – And that’s what I kind of wanted to know, because I know a lot of people are like, oh, I’m going to spend all this time creating this special course or this special post and they don’t put as much effort into the promotion, so when they don’t get the results that they want, they’re really disappointed and I don’t know, it’s not that their course or that their post isn’t good, a lot of people don’t really know how much time just the promotion takes. Kristi Hines – Yeah because I can see it with some of my clients too. I mean, I’ll write this huge awesome post on their website, I’ll do promotion for it, but they won’t. Versus the clients that go out and do promotion and I do promotion, like obviously the ones with the best promotion always do the best and it has nothing to do with the level of the content, it just has to do with how many people are getting exposed to it basically. Sheryl Loch – So your course that you put out now, that’s what people are going to learn is how to effectively promote? Kristi Hines – Exactly, you learn the promotion and I also put a bonus section in there for people who don’t have an audience, like how they can build their social media audience, their email list, because that’s a big part of it too. If you have no one to promote to, then it’s going to be really difficult. So I kind of included both of them in there. So like if you already have an audience, you can jump right into the promotion strategies, if you don’t, you can look at that part first, build your audience, and then go into that. Sheryl Loch – Okay cool, so we’ll be sure to have a link to Kristi’s course down below in the description too. So, ya’ll that want to learn promotion, better check that out. Brian Hawkins – The name escapes me, but I believe it was with Social Triggers, I listen to his Podcast every…. Mitch Mitchell – Derek Halpern..
Kristi Hines – Derek Halpern, yeah.. Brain Hawkins – I love him, you said that you spoke with him, I think you had mentioned on one of your posts, that you should write 20% of the time and promote 80%. Kristi Hines – Exactly, and that’s kind of the foundation of my course too, it’s like you could produce one piece of content, and this is what he says too, you could produce one piece of content and just keep promoting it and promoting it, and you’ll get tons of traffic, tons of subscribers, based just off that, versus trying to put out a new piece of content every single day and not spending a lot of time promoting it. Then you might not get as much traffic, simply because people aren’t coming to it. Brian Hawkins – One authoritative blog post a week is better than five or six a week if you’re not going to promote them..
Brian Hawkins – And they’re not going to be the quality that you’re looking for, so I think that’s great. I think that a lot of bloggers are confused by that. They think that they need to get something out every day, no matter the quality or the promotion. Sorry Mitch, I didn’t mean to hog everything up so far. Go ahead. Mitch Mitchell – No, this interview is everybody. So, we’ll ask this next question. I’m sure a lot of people are wondering, Brian may actually have even touched on it. What is your process to deciding what to write about? Do you walk around with a notebook, write down topics when you think of them? You mentioned being in the store and checking social media, but do you have those types of things? Do you have a recorder, every once in a while, when you have that germination of an idea, how do you actually then put it together and decide, okay this is now going to become the blog post? Kristi Hines – It used to be that I’d write blog title ideas everywhere. In like Post-It-Notes, notebooks, and like the back of a check or something and now I’ve gotten focused to the point that I always send it to myself on Gmail. Then I put it in my draft’s folder and I can look at that and see a bunch of blog title ideas the second I go to it. Usually, I’ll just pull from that and sometimes I’ll make an outline with it and if I don’t have enough time to write the post at that point, at least I have an Idea the next time I go back to it, here is what I had in mind for it. So just pretty much any time that I have an idea, I just try to make sure that it’s down somewhere that I can find it later. That also keep all my topics going and I also subscribe to about 250 Blogs. Kristi Hines – I find that if you have that many subscriptions, even if you don’t read it all. You can go through the titles everyday and you’ll get a lot of different ideas just doing that. Or, you’ll see that this is something really hot right now, because ten other people are writing about it; so it definitely helps. Mitch Mitchell – And then when you’re ready to actually put one together, you told Brian that it can actually be an hour or two, sometimes it’ll be longer. Do you worry so much about the research that you have to put together or at this point do you have to have a lot of knowledge already? Kristi Hines – I like to go out and find statistics to back things up. I know every year that things change, like something that was going to affect last year, isn’t going to be that great this year. So I go out and kind of make sure it’s still really relevant and everything. A lot of times, I’ll just fill in everything that I know and then go back and fill in my outline, I go research some stuff to fill out all the stuff I wasn’t sure of off the top of my head. And a lot of the stuff that I do is really how-to tutorials, so I make sure that I go through a lot of the steps as I’m writing the, that way it’s really as accurate as possible. Because sometimes I don’t have control of when people publish things. On Social Media, that could be really challenging, because someone publishes a thing a week later. Oh Facebook changed their interface, so this is wrong. Mitch Mitchell – It’s like when you were typing all those guest posts. Sometimes you’d just read a guest post and it’d be like…Wow…it’s like there is just clasped a whole lot of stuff. You know? They took for granted that people knew these things. I love how Sheryl puts her stuff together, she does it step by step and when you do your stuff and we see it, you do the exact same process. Kristi Hines – Yeah, because especially, I like doing screen shots and I’d rather not pull something I did a month ago, I’d rather just go do it again and get something as current as possible, because even little things change that you may not notice, that somebody will and they’ll be like, hey that doesn’t look right. Sheryl Loch – Yeah and they change so fast that by the time…I’ll get a video up and I’ll think, oh it’s doing great and with the social media, especially sites we don’t have control over, two weeks later, people are making comments about, what is this and I’m like, well you’re late. It’s a constant when you start doing some of that. I’m sure you see that, where people are thinking that you’re lost, but it’s just two weeks after the change. Kristi Hines – That and Facebook is always an issue, because they always roll out things to some people and not other people. So I’ll write a post and they’ll be like, well my ad interface looks completely different. I’m like; mine doesn’t, so I don’t understand. It’s just the way that they roll stuff out; you don’t have control of when you’re going to get the new stuff and other people. Brian Hawkins – I have a quick follow up on Mitch’s question there on blogging. Do you worry anything about the keyword research on yours at all or on anyone else’ or do you just go with it and let the search engines figure it out? Kristi Hines – It all depends, I have some clients who are very particular about keywords, so they’ll actually give me a keyword phrase, so they’ll be like, build me a post off of this. As far as the stuff that I do on my website, I usually just write the post first and then I’ll think about, okay what keywords would people be searching for that this post would answer, then I’ll optimize it for that. I try not to focus too much on the SEO and focus more on the people value, when the go read the content and how much is a person going to like this? Are they going to want to share this, are they going to want to comment? That’s the stuff that I prioritize first and then SEO comes afterwards. Brian Hawkins – Cool, Reader Value first. Mitch Mitchell – Always great. What do you think that your big break was, that turned Kristi Hines into, in my terms, a superstar? I mean, what was the really big break. Did someone find your blog post and be like, and Tweet it everywhere, did some big company say, could you write for us and it just took off, you know where do you think that it began? Kristi Hines – If I think about my blog success, I think that came from Social Media Examiner. In 2010, someone from their site found me and they got me into the top ten 2010 Social Media Blogs and I got nominated into that list. That was just a huge burst of traffic and new audiences that definitely helped with that. As far as my freelance writing, it was just doing guest posting. I was doing methic Search Engine, Journalist Search Engine in particular and my first client found me off of those and they were like, hey we’ll pay you to write those same kind of post for us. So I think a lot of it was guest posting and Social Media Examiner definitely, was the jumping point. Mitch Mitchell – So now, we talk about the marketing and one of the things that we’ve mentioned here over the years is that, people, you know you can’t just write your post, you have to go out and actually find the market and one way to do it, is to comment on other blogs, so that people can find you. But we all know that that is not a long term strategy for success, to success, just commenting on other blogs. So when you’re doing this marketing, is it kind of a tenacious thing, that you maybe have to do, or it’s settled across different platforms and the reason I ask that, is that I know we’re both on Twitter and I see how some people have something coming out every five minutes, almost like 24 hours a day, and eventually I just drop all those people, because there is just no way that anyone can keep up with that and to me, it just seems over done. I mean, what’s your kind of thought on that? Kristi Hines – I think that blog commenting always works, I haven’t had a lot of time to do it lately, just because I’ve had so much other stuff going on, but I’ve noticed that if I take a month and go comment on a bunch of blogs like successively throughout that month, I’ll see my website traffic pick up. It’s just that it always works, people are looking through those comments and if you contribute something valuable, they always want to kind of come learn more about you. A lot of it is just social networking, even if you’re just kind of being friends with people, you don’t have to be marketing to them, just kind of talk to them for a while. You know; like when you do put something out, they’re already engaged with you and they’re going to go check it out so think that it’s in general kind of engaging, and conversing, and interacting with people. Kristi Hines – Yeah, I mean definitely, if you keep up with the relationships that you build, like that’s a big thing. Like I’ve noticed that there are times when I get really focused in on my work, and I won’t interact as much and I’ll Tweet something and I won’t get as much response on it. Versus, if I’ve been out there and I’ve been talking to people a lot more, if I do Tweet something, I’ll get a lot more response from it. So sometimes, if you’re in casual conversations with people, it just kind of keeps you on top of their minds. Therefore, when you’re promoting something, they’re going to be interested in it. Kristi Hines – As far as photography, that’s actually something that my husband does. One of the good things, is going out to the little Q & A Networks and especially photography forums and look for things that people are asking about and if you look through that sort of thing, you’ll find that people are like, oh, how do I process this, or how do I get…I don’t know a lot about photography, honestly, but you know, how do I get this spot out, or why is my camera doing this little red glare, like if you just look through all the questions that people are asking, there is a good chance, that you’re going to be like, Oh, I know the answer to that question, then you can just turn that into a blog post, or a video, or a tutorial. I know that’s how my Husband has done some of his Photoshop tutorials and he’s gotten a lot of views just based off answering questions that people are searching for a lot. Brian Hawkins – I can remember a while back, this may be two or three years ago, but you had, I know I read something about where you were doing this macro photography. Do you think it’s better, because photography is a huge niche, maybe to niche themselves down a little bit, rather than try to tackle photography as a whole, you know, maybe macro, or micro, or you know black and white, just niche themselves down into closer towards their interest. Kristi Hines – Yeah, there are different break downs. There are some people that just talk about Nikon equipment and some talk about a certain set of processing tools. Some people do HDR photography, some people do the urban exploration, that’s one thing that I got into for a while, and you can find little groups of people that are just like, insanely excited about those small topics within photography, and that’s like a great way to build your audience up. Just find those groups. Brian Hawkins – I’ve done it in Detroit, just as a little hobby, I didn’t blog about it, but it was fun. Fun times yeah, okay, I think that’s all for questions, I deleted all the spammy ones. Go ahead Mitch. Mitch Mitchell – Here’s basically my final question, well generally my finally question, I’ve been reading a lot of stuff lately, where these experts, and in my opinion, these are people that don’t blog, they think that blogging is going to die off and we don’t necessarily believe that kind of thing, because I’ve noticed that what people seem to share a lot are, Blog Post from other people. So, what are your thoughts on these “Experts” thinking that blogging is going to die? Kristi Hines – Sometimes I think that’s based on the experts own interest, like maybe they’re into Google Plus right now, so they’re like, “Oh, blogging is dying, so let’s all just move to Google Plus”. So yeah, sometimes I think it’s that and sometimes it can be like, niche specific too, because I know in photography, I know some bloggers that are having some trouble getting people back to their blog, because all the photographers are just posting stuff straight to Google Plus right now, so some of it might be niche related too. I’ve always personally believed that having your own blog, is just something that you personally have to do. It’s just that, if you put everything on Google Plus, if Google Plus just one day drops away, you’re going to lose all of that content, all of that Engagement, versus if you have your own WordPress site, that’s something that you can keep with you, no matter what. Mitch Mitchell – Yep and I agree. We all have our own blogs and some of us have multiple, actually, I think all of us have multiple blogs of some type. I’m sure you’ve got more than just Kikolani, but you’re just kind of shying away from the rest of them. Kristi Hines – Yeah I have some inactive ones. Mitch Mitchell – Yeah, but it works out. Sheryl, Brian, do you have any more questions for Kristi today? Sheryl Loch – No, I know she has a little one and since she’s Super Woman, and travels, and blogs all over the place, takes care of a little one, I know she’s busy. She’s got stuff to do. Kristi Hines – I’m actually pretty impressed that you guys haven’t heard her yet, she’s been screaming all morning, so I was sure that she was going to make an appearance at some point. Mitch Mitchell – Really? I would have loved an appearance, Brian you got any other questions? Brian Hawkins – Yeah, I just have a real quick one, would you care to share an internet resource that you’re just in love with, something like an Evernote, or an internet tool that you just find very valuable for bloggers? Kristi Hines – Right now, I’m really into, If This, Then That, it’s ifttt.com and it’s basically just got a lot of little Automation Tools that you can kind of Plug into Different Things. One of the ways that I use it, is that I know that I might now be online immediately, when like, some of the post that I write for Clients go Live. So one of the things that I do is if I set it up and you say that if this RSS Feed has a new Item, you put it in the Buffer. So I take all the RSS Feeds from my Author Link on the Sites that I Write for and just kind of put it in there. That way, as soon as one of the posts goes live, it’ll automatically get tweeted out. Then that way at least, if I’m not online immediately, I’m still promoting all of my client’s work. Mitch Mitchell – We’ll put that down below. Brian Hawkins – Yeah we’ll put the link to that down in the description, in the show notes. Sheryl Loch – I was going to say, Kristi, if you happen to think of a blog post that you have that is talking about the If This, Then That, send Brian, Mitch or I the link and we’ll put it in the description, so other people can get a better idea of what it is, because I know that I’ve used it a couple of times, but for people that just go there, they’re going to be massively confused. So if you’ve got something on it, be sure to send it to us. Kristi Hines – I don’t actually, but that is one of the drafts that is in my list of things to write about. Mitch Mitchell – There you go. Sheryl Loch – Well, one day when you get it, we’ll have the video there. Brian Hawkins – We’ll find something fun though, I’m sure that there is something on the site for people to take a look at. Well, I really appreciate you taking the Time to do this with us today Kristi, it’s been a blast. Kristi Hines – Definitely, I appreciate you guys inviting me, I love doing Google Hangouts. Mitch Mitchell – But we want to give you this opportunity, just close it out, tell everybody who you are, promote yourself, go for it, let people know where they can find you. Kristi Hines – I’m Kristi Hines, I do freelance writing and I’m a blogger at Kikolani.com. That’s the main place that you can find me and my new course is BlogPostPromotion.com. Mitch Mitchell – There you go, so thank you very much Kristi for joining us today. Like I said, I’m here with Brian and Sheryl and we do these things on Sundays, around one o clock, Eastern Time, and you can figure that out where ever you are. And thank you very much, we’re all done. Brian Hawkins – Thank you, bye now.